MARVEL'S WHAT IF...? Gets an Animated Series! What If Marvel produced an animated series base on the long-running, alternate reality/speculative comic series, "Marvel's What If...?" 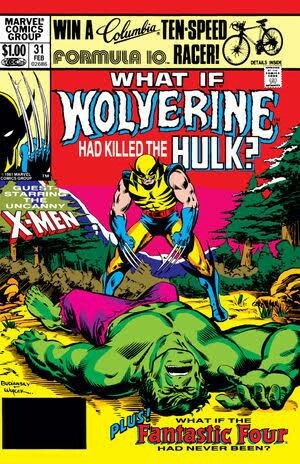 If you've pondered that question (I have based almost solely on one of my favorite comics ever, the "What If Wolverine Had Killed The Hulk?" issue (What If...? #31, published January 1, 1982), you need no longer speculate! Disney/Marvel announced this week that it's happening! The "What If...?" comic series has been published across several runs (VOL 1, 1977-1984; a one-shot in 1988, VOL 2, 1989-1998; VOL 3, a 6-issue series of one-shots in 2005;, VOL 4, another run of six one-shots; followed by short runs in 2006, 2007-8, 2010, 2013, 2014, 2015, and 2018). Obviously, the freedom writers enjoy in not being limited by the constraints of canon is just too alluring not to explore. As a fan of the series, I can say that it's just as engaging for the reader. MARVEL'S WHAT IF? will bring that same sense of freedom from canon constraints, and open endless opportunities for exciting stories that explore what might have been. Presented in an animated format, it will be less dependent on actors' availability, and as a result, the appearance of MCU characters will be near unlimited. As reported by /film (www.slashfilm.com/what-if-tv-series-coming-to-disney-plus/), the series will mostly explore scenarios from the MCU unfolding in a different way, rather than rehash the stories from the comics (though select stories from the Marvel Comics series will be carried over). With MCU head, Kevin Feige. at the helm, I expect this series will be hitting some great film moments from wildly different angles. The series will be run on the upcoming Disney+ streaming service, with release dates to be announced at a later date (my money is on a full announcement at SDCC), joining an already huge list of Marvel/MCU shows on the platform. I'll follow up with more info on this exciting series as Disney/Marvel release details, but for now, I''m gonna go dig through my old issues and explore countless mini-alternate universes with them!